The monument designed in 1920, “Bank Building in Amsterdam School style” is located since 2016. The Gin Sum Club. A restaurant with high quality and class, where ‘East meets West’ is central to his best form. The concept of the client consisted of combining a high culinary Asian cuisine with the feel of an upscale gentlemen’s club. The translation of these two very different worlds Claire Ansems has made by running the colours and materials in the Asian style and by the decor and design again keep very European. The colours black, gold and copper have been found throughout the restaurant, like leather armchairs, steel and lockers where guests can drink their self included stables: the Liquor Lockers. “This is really unique in Haarlem, the lockers are almost all rented out.” In addition, in the basement was preserved the big bank vault. The collection of Lensvelt Contract Furniture fits into the concept and image / material story Claire Ansems has devised for The Gin Club Sum. 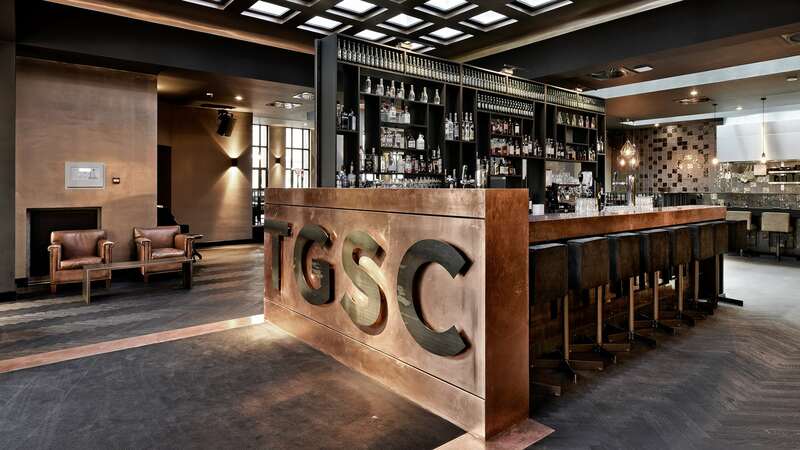 For TGSC made use of the PH1 stools because of their tough rugged appearance in front of the delicate Asia. The AVL Shaker bar stools have been conducted with copper plates to fit into the concept and AVL Sleeve chairs fit perfectly into the overall picture because of the beautiful design of the frame.